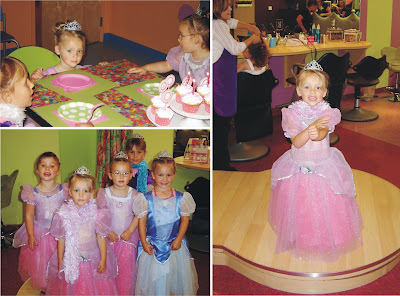 Maddie had a great birthday and she was soooo excited to be transformed into a little princess along with a few of her friends. 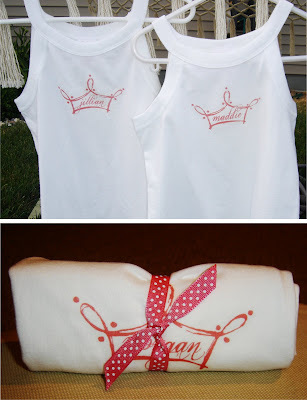 It was so fun to see the little girls prance around all decked out. And to hear their little conversations and seeing the smiles was priceless. 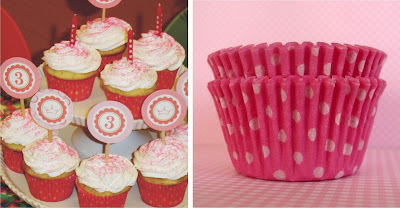 I had a lot of fun preparing for her party and I knew that I wanted things to coordinate. I'm not a foo-foo-la-la type of gal so I knew that I wanted to keep things simple. 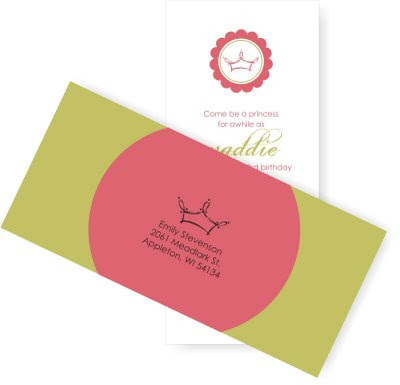 You might remember the invites I designed with the crown I drew. I wanted to carry that and the colors throughout. I found these adorable pink star suckers that looked so much like wands. The girls even pretended as if they were so the thought was perfect. I tied a simple green satin ribbon around it to decorate it up a bit. I know I've mentioned that my daughter loves lip gloss. 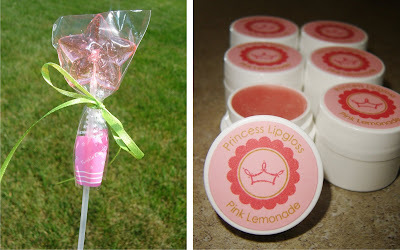 I found a few recipes online to make homemade lip gloss and this one was perfect. So simple with only 2 ingredients: Vaseline and flavored drink mix. I used raspberry lemonade Crystal Light. Just the right amount of pink flavor. All I did was mix 2 T. of the Vaseline with a dash of the Crystal Light and filled it into these great containers I bought from this Etsy store. I then made sticker labels for the top of them and voila! 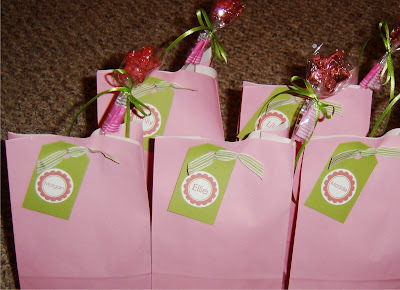 I filled all the above along with a few other goodies..stickers and princess gummies into small pink bags with ribbon closures. They had so much fun going through it all. The princesses had so much fun. I know my princess did since she went to bed very early that night!!! Wow, you have such great ideas and I love the way you coordinated everything. Maddie makes a beautiful little princess and I'm pleased to hear she had a wonderful birthday!